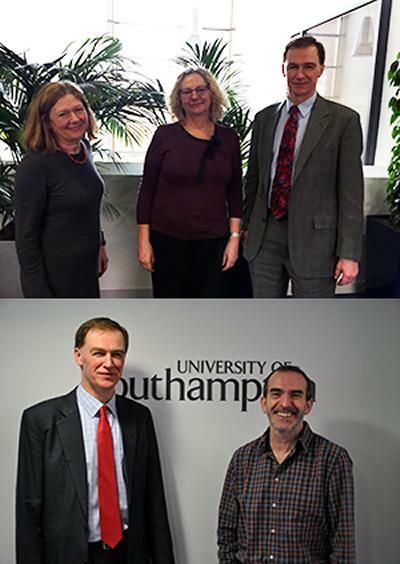 Last week Provost Professor Mark Spearing welcomed Professor Jim Best and Professor Melissa Steyn to the University as part of their first visits to the University as Diamond Jubilee International Visiting Fellows. Professor Jim Best, Professor of Sedimentary Geology from the University of Illinois at Urbana-Champaign, will be hosted by Professor Stephen Darby. During the course of the Fellowship they aim to focus on joint research into the morphological and sedimentological dynamics of monsoon-affected rivers, to develop the application of Parametric Echo-Sounding (PES) imaging techniques to studies of sequence stratigraphy in Cambodia and to carry out studies of channel migration on major rivers such as the Mekong. Professor Melissa Steyn, Director of the Wits Centre for Diversity Studies at the University of Witwatersrand, gave a Social Sciences Distinguished Lecture on the topic of “Apartheid supporters and other extinct species”. The Fellowship will provide opportunities to collaborate with her host, Professor Pauline Leonard, on the development of opportunities for doctoral researchers and Early Career Researchers, and to carry out joint research on changing work contexts in South Africa and other BRICs countries. The Diamond Jubilee International Visiting Fellowship scheme was established in 2012 to promote collaboration with eminent scholars worldwide and develop joint activities over a three year period. Since the scheme began twelve Fellows have been appointed. The call for 2015 Fellowship applications is currently open until 15 February 2015.